Sleepy Hollow has been cancelled after four seasons. The show probably was fortunate to get a fourth season after the debacle that was the end of Season 3. I made my thoughts clear on my displeasure of the way the third season ended. I have not watched any of S4, mainly because I forgot it had come back. I will admit the only Fox show I watch is Gotham but even so, I never saw any advertising for it during that show. Maybe there were ads during other shows, but they weren’t working. The fantasy-cop drama saw its ratings plummet in season four, averaging a 0.5 rating in the 18-49 demo and 1.9 million total viewers — down 40% in the demo and and 37% in viewers from season three. It’s sad to see such an interesting and unique show fall from grace. The first season was so good. It took a classic Revolutionary War story and expanded on it, with a pair of leads that had amazing chemistry and a fish out of water story of a man who fought for America and got to see the dream realized. Throw in a mix of the supernatural and you’ve got a great premise. The first season delivered, the remaining, well your milage may vary. The heart of the issue is the terrible way Nicole Behaeri was treated. Her Abigal Mills was as much what made this show successful as Tom Mison’s Ichabod Crane. The chemistry they had was so good and so natural and it was the main reason why S1 was so good. The supporting cast was also great, with actors like Orlando Jones, Clancy Jones and the Steward of Gondor, John Noble playing memorable characters. As the show went on, more and more supporting characters were added, but sadly some of the best ones like Orlando Jones were forgotten about as new ones were added who had little purpose or who added little to the plot. We also saw Abbie getting less screentime as more was being given to Ichabod’s wife Katrina, which led to frustration from Nicole. Things came to a head when she wasn’t invited to take part in the DVD commentary for Season 2. Things didn’t get better in Season 3 as even though Katrina was killed at the end of S2, a new character, Betsy Ross had been written in. 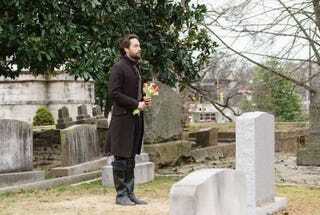 A past lover of Ichabod and a fellow solider in the supernatural side of the Revolutionary War, the final nail was in the coffin for Nicole, and feeling that things were not going to get better, left the show. The show tried to give a new female co-lead, and for some reason move the show outside of the titular city but ratings dropped, I believe in large part because of fan reaction to the way Nicole was treated. It seems that fans of the show are not crying over its cancellation, in fact they seem estatic. Fox Just Canceled &apos;Sleepy Hollow,&apos; and Fans Are ... Thrilled? I can’t say I blame them. I don’t have issue with Tom, he’s a fine actor. I don’t like seeing people lose their jobs. But it was time. I’m just close this out with some words from James Whitbrook’s I09 article. Sleepy Hollow started out as one of the biggest surprises on TV when it kicked off in 2013, mainly thanks to the remarkable charm of Beharie and Mison whenever they were on screen together. Sadly, the show quickly broke down in its second season, and by the third, not even the chemistry between Abbie and Ichabod could save the show from the convoluted mess it had turned into. Farewell, Sleepy Hollow. We will remember you for what you once were, rather than what you became.